The suburb of Abbotsford is in the concrete heart of Melbourne. Its streets feature poky terrace houses, fallen leaves and busy souvlaki shops. Its most prominent landmark is Victoria Park, the former home of the Collingwood Football Club, an inner-city icon. So it comes as a surprise to find a patch of land in Abbotsford that is tilled by vegetable gardeners. From 1865, when land in Abbotsford was taken up by the nuns of the Order of the Good Shepherd, it has been the site of a convent and a female reformatory. Those in the reformatory worked in vegetable gardens and orchards that thrived on the rich soil of the land’s flood plain on the Yarra River. In 1979, the Collingwood Children’s Farm took over the convent’s farmland, part of which was maintained as a vegetable garden. 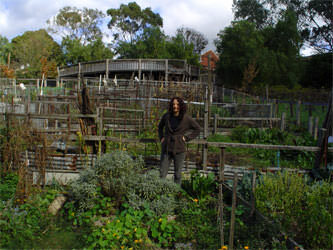 Since then, the small plots in the garden have provided a rare connection to the earth for inner Melburnians. Jo Searle, a 36-year-old social worker, has been riding her bike along the Yarra River to reach her plot at the children’s farm for five years. A drugs and alcohol counsellor in Footscray, she says the bike journey, and tending to her vegetables, gives her a chance to clear her head. Home for Searle is a flat in Clifton Hill that she shares with her eight-year-old daughter Meg. 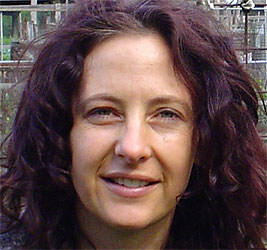 During Searle’s childhood in Surrey Hills, in Melbourne’s eastern suburbs, her parents had owned a small farm at Balnarring on the Mornington Peninsula. When her parents sold that farm, she took up the plot. For some, the attraction of tending a plot has less to do with the view of towering gums on the opposite bank and the sense of quiet by the river than it has to do with reconnecting with a former life. A good proportion of the vegetable gardeners are immigrants from southern Europe; Greeks and Italians whose forebears worked the soil in their rural homelands for centuries. Tending plots enables former immigrants to maintain a sense of continuity and connectedness with their forebears' culture. 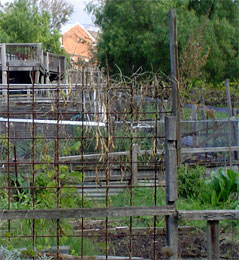 Others vegetable gardeners at the children’s farm are from the housing commission flats in Collingwood. Tilling the earth is an antidote to looking over the smoggy inner suburbs from several storeys high. Searle says she enjoys the community at the plots, where advice is frequent on what to grow and when. She likes broadening her knowledge of plants and the conditions they need. She takes great pleasure in growing so many cherry tomatoes that she can boil up a big load to make chutney and still have enough to take to colleagues at work. The tomatoes taste sweet and fresh. 'I give away heaps,' she says. The cost of tending a plot is $100 a year for those with employment and less for those on concession. All of those who lease a plot are expected to attend four working bees a year and make an effort to keep the weeds down. Searle says one way of limiting the spread of weeds is to avoid growing vegetables in rows. Such rows would give weeds unimpeded turf in which to flourish. Just as importantly, they would fail to reflect Searle’s idea of a garden. At the beginning of the interview for this article, Searle was delighted to find four eggplants, about 10 cm in length, which she put in her bag. She also looked over the artichoke plants and a silver beet in the plot’s back corner. The front of the plot, which is about four by five metres, was taken up by borage, a purple herb that spreads quickly throughout gardens and gives salads a lift. Searle’s understated comments suggested pleasure in the herb’s aesthetic qualities. In recent months, Searle’s interest in growing vegetables and herbs has rubbed off on Meg, who has grown sunflowers and taken great pride in their rapid progress. During the summer just gone, Meg took to bringing school friends with her to check out the plot. In the weeks to come, Jo must decide whether to keep the plot. The demands of work, home and a Master's degree in public health leave little time to attend it. Searle says it would be a sad day if she were forced to give it up; besides the loss of a link to the earth, it would mean the loss of a growing bond between mother and daughter. 'We’ve got quite a connection here,' Searle says. Paul Daffey is a Melbourne freelance journalist, whose book Local Rites: A year in grass roots football in Victoria and beyond was published in 2001. I understand this as I too love the getting back to nature anad eating true food. The article is well written and intesting. 'fruit of the vine, work of human hands' Our mother the Earth is always so healing. Great story and all the best to Jo.